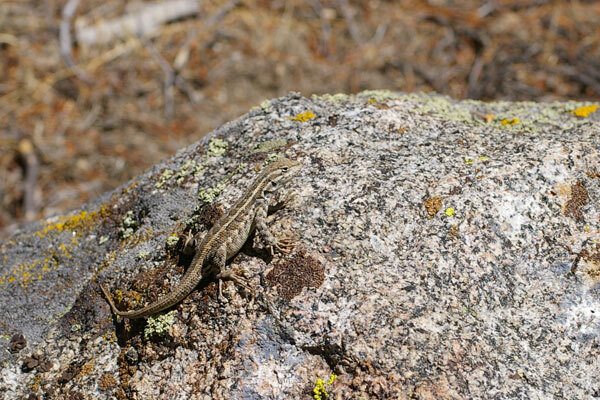 Sagebrush lizards were my only reptilian companions in this High Sierra camp, but at least they were plentiful. 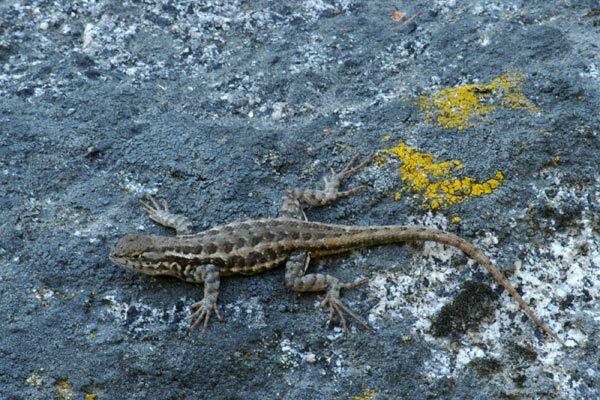 The big adults have some orange on their sides, which distinguishes them from Western Fence Lizards. This orange is most pronounced on females in breeding season. I think the second photo here is of such a female, though the orange didn't come across very strongly in the photo. 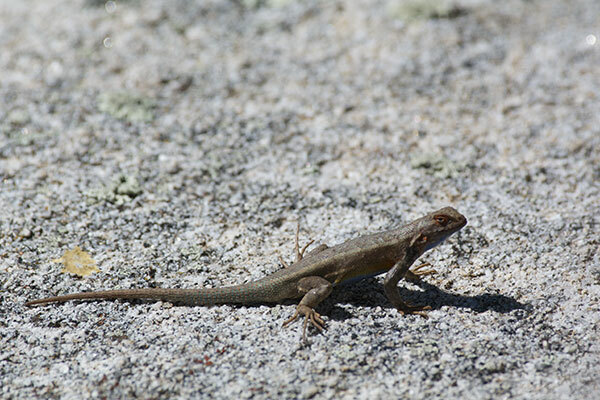 Just like at Peppermint Camp, around Shaver Lake these were the only obvious lizards. Still, any lizard is better than no lizard, I always say. On the last night before we returned home to coastal California after a five-week trip to Colorado and back, we found a pretty campground along a river south of Lake Tahoe. The nearby forest had its share of fallen logs under which to look for herps. I did find a couple of Sierra Nevada Ensatinas that way, but other than that, the only herps I ran across were a bunch of sagebrush lizards. The wild lands around Kennedy Meadows are strewn with boulders and the boulders are strewn with three types of similar lizards. 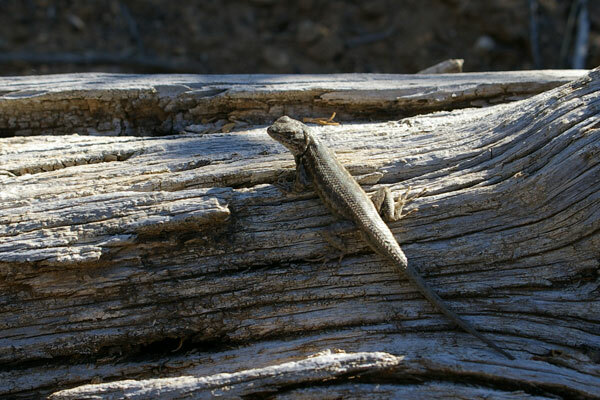 Sagebrush Lizards were the middle-sized species of the three. 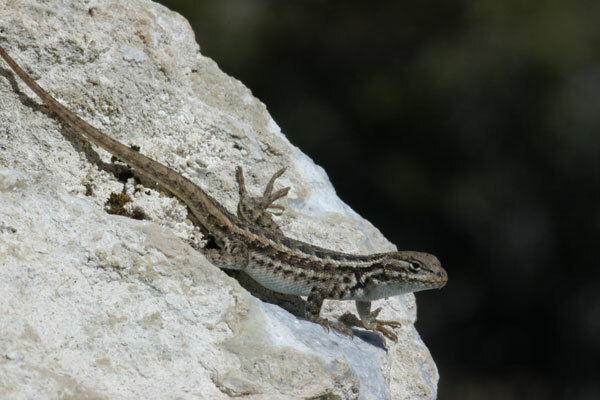 On the larger side were Sierra Fence Lizards; on the smaller side were Side-blotched Lizards. This poor fellow has lost its tail, but it posed quite well for me. It's extremely difficult to tell a sagebrush lizard from a Western or Eastern fence lizard, but I think I got it right, after consulting numerous references. Mono Lake is famous for its high level of salinity and the odd collection of wildlife it supports (brine shrimp, flies that hunt underwater, and vast flocks of birds that eat the flies & shrimp). It's also famous for its ever-lowering water level ever since Los Angeles began sucking away the water from its major feeder streams several decades ago. An environmental campaign to Save Mono Lake in the 1970s has helped out, but the jury is still out on whether the lake will survive in an environmental sense. Mono Lake contains odd underwater calcium carbonate statues called tufas. The declining water level has exposed and indeed stranded many of these tufas. The local lizard population decided that this was a good thing and use the stranded tufas as lookouts. 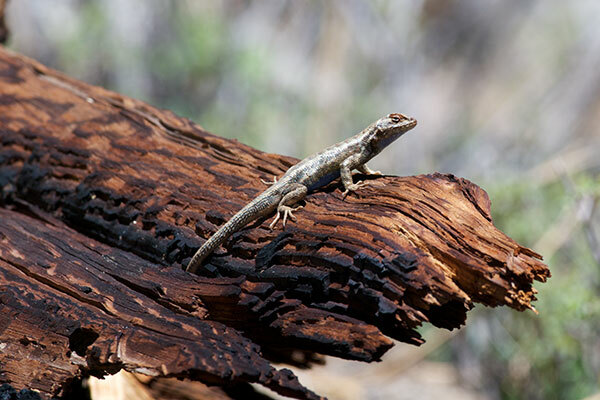 I wasn't sure if the lizards I photographed here were Western Fence Lizards or Sagebrush Lizards, so I asked the local ranger, who told me they were Western Fence Lizards. 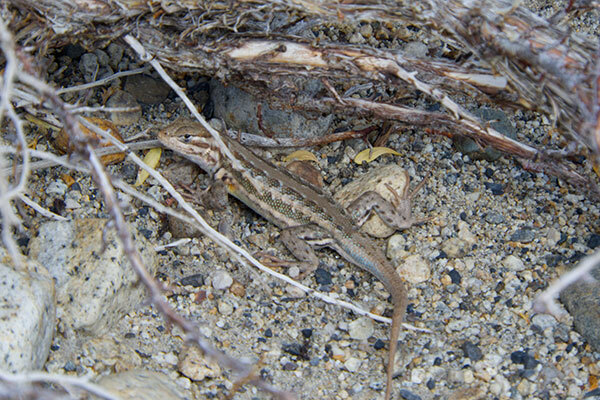 However, the color pattern under the chin in this photograph establishes that they are definitely Sagebrush Lizards. If they were Western Fence Lizards, the blue under the chin would be in two thick blotches, not the blue-and-white mottling you see here. Those darn rangers. Hammerson's excellent Colorado field guide includes a table listing the species recorded in various parks and preserves. From this table I learned that Mesa Verde National Park contains a bunch of herps that I had yet to encounter anywhere, including Tiger Salamanders, Western Chorus Frogs, Variable Skinks, Milk Snakes, Smooth Green Snakes, and Prairie Rattlesnakes. But what's the only type of herp I saw there? Yup. Sagebrush Lizard. Oh well, the cliff ruins were very nice. 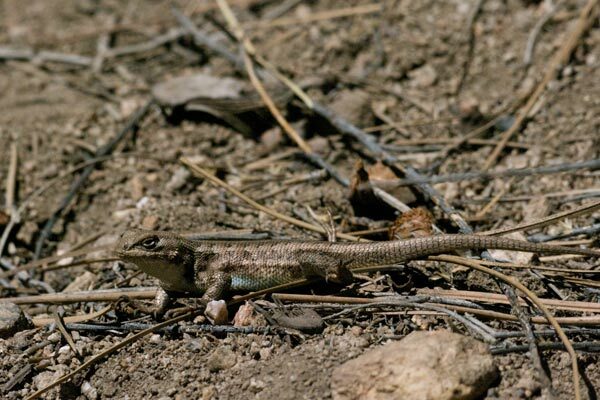 As at Mesa Verde, at Great Basin National Park the only lizards I managed to see were these sagebrush lizards. By this point on our journey from Colorado back to our home in coastal California, I was a little tired of sagebrush lizards, though this one did pose rather nicely. 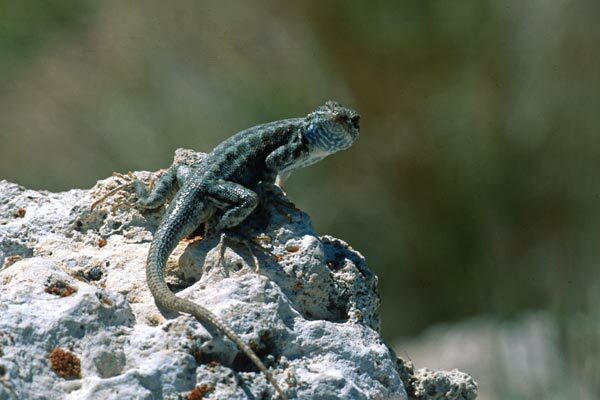 Typically, sagebrush lizards have a similar ecological niche as fence lizards, but live at higher altitudes. 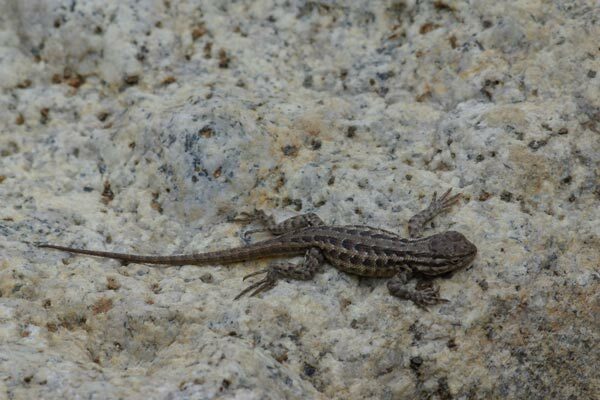 At Whitney Portal, I saw both species inhabiting the same piles of granite boulders, so they must have found some way to divide up the medium-sized spiny lizard ecological niche. The fence lizards here were particularly huge, so maybe they partition their prey by size also. Monica and I checked out the nice Forest Service visitor center at Mono Lake on an overcast afternoon, and took one of the short trails out the back of it. It was not a very lizardy afternoon, but we saw a few sagebrush lizards living up to their name, of which only this one stayed semi-exposed long enough for a photograph. 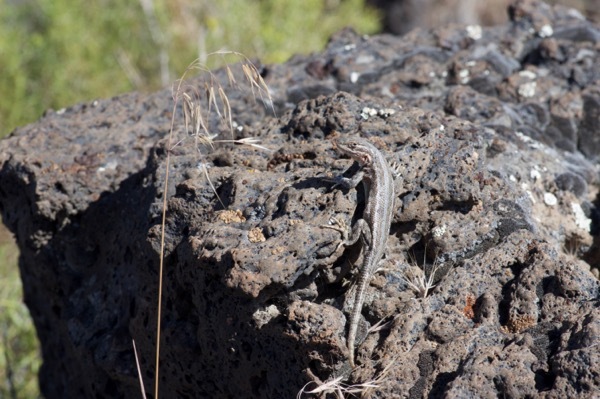 The dark lava rocks in the Oregon Badlands were decorated with an assortment of Sceloporus. The vast majority of the ones I saw were Sceloporus occidentalis longipes, but this one clearly shows the smaller scales, striped pattern, and peach-colored cheeks of Sceloporus graciosus. 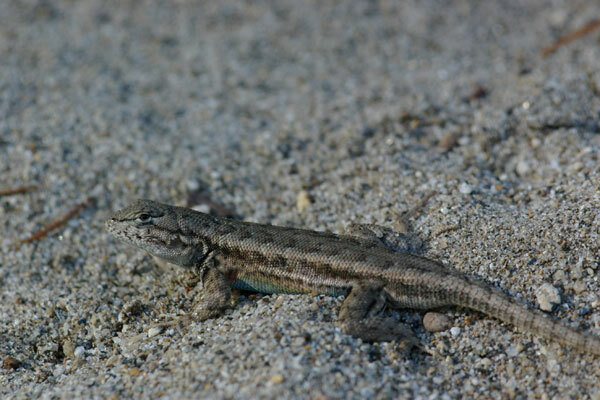 These lizards were plentiful around our campground at the edge of Big Bear Lake, but they were difficult to photograph. They would typically dash into the nearest bush (sagebrush, of course) at the first sight of me and my camera, then annoyingly skitter from one side of the bush to the other, without ever heading back into the open or disappearing completely down a hole. 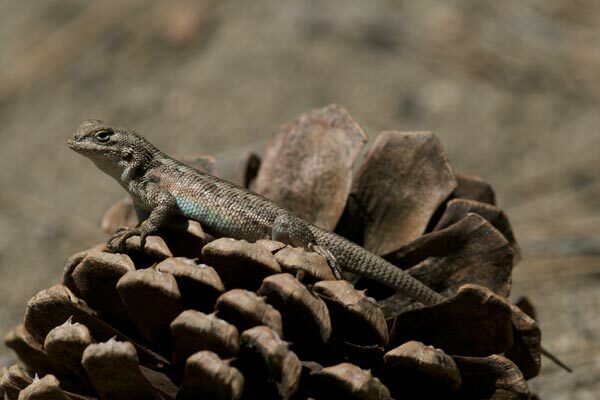 I think this one finally got tired of me wasting its precious basking time so it eventually stopped scurrying and hung out in the open and even posed nicely on a pine cone. 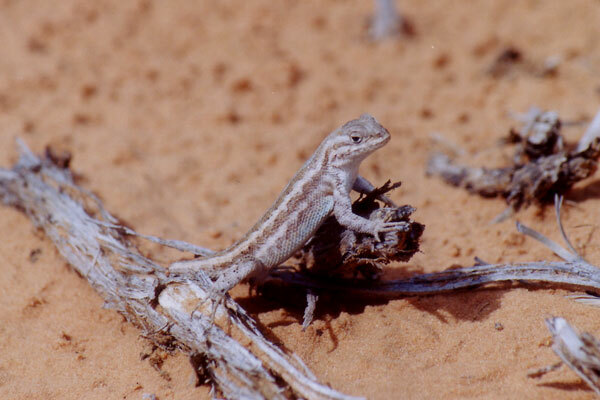 Some authorities consider the Southern Sagebrush Lizard a distinct species, Sceloporus vandenburgianus. 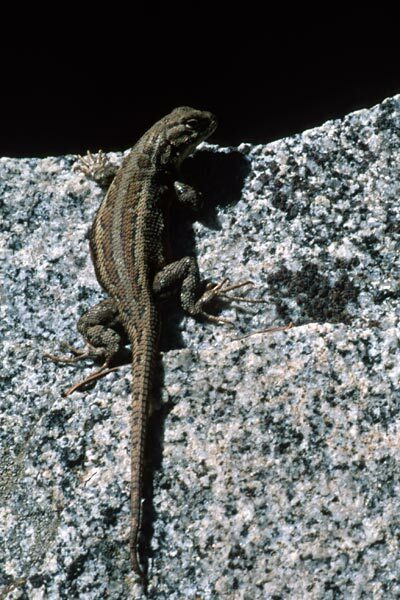 The population of Sceloporus graciosus vandenburgianus in the Sierra de San Pedro Mártir is separated from the nearest other population of this lizard, in the Laguna Mountains of San Diego County, by over 125 miles. 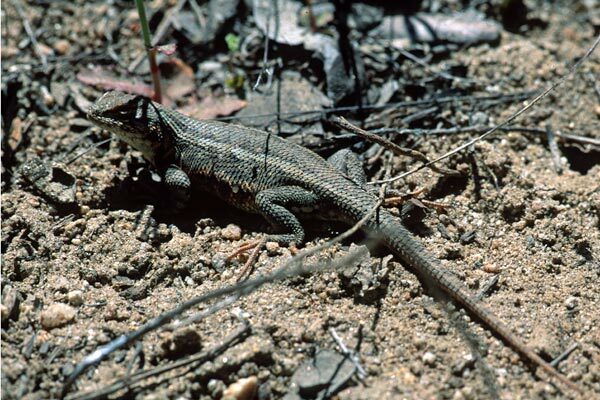 These lizards live only at high altitudes; apparently they have been displaced by Sceloporus occidentalis in the lower-altitude intervening areas.